Kelsey Bond is an associate in Brown Rudnick’s Commercial Litigation group in the Hartford office. Kelsey represents individuals and entities in all aspects of litigation in state and federal courts across the country. Kelsey has experience drafting pleadings, briefing dispositive motions, and conducting discovery. 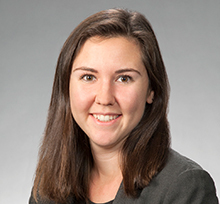 While at the University of Connecticut School of Law Kelsey was the Assistant Managing Editor of the Connecticut Public Interest Law Journal, a member of the Moot Court Board, and earned CALI Excellence for the Future Awards in Pre-Trial Litigation, Evidence, and Constitutional law. Prior to starting at Brown Rudnick, Kelsey externed at the Equal Employment Opportunity Commission in the Appellate Services Decision.